The recent sale of George Rickey's sculpture, "L's -- One Up One Down Excentric" outside the National Steel Center on Stanwix Street downtown caused a great deal of concern about the fate of remaining pieces of privately-owned artwork on public display throughout Pittsburgh. Rightfully so as time and time again across the country, art in public places are sold and moved to private locations far away from the originally intended site. The concern about the future of public art in Pittsburgh is so great that according to Next City Mayor Peduto is investigating how to safeguard public art by creating an inventory and reaching out to the owners for more permanent assurances that everything will remain in place. This is a fantastic step towards protecting the cultural expression so integrated into our urban fabric and closely parallels how our City's preservation ordinance works. When a building (or more aptly in this case, an object) is designated it enjoys a degree of protection in that proposed changes would need to be first considered by the Historic Review Commission through a public forum. This includes reviewing potential moves. And this process can - and has - been applied to pieces of publicly-accessible art. Moretti's Horse Tammer Sculptures and Welcome Sculptures both enjoy protection as designated historic objects. Earlier this year a nomination was also submitted for the stained glass windows in former St. George Church as they are in danger of being removed from the former church and shipped outside of Pittsburgh. Other pieces of art like the USS Maine Memorial, Civil War Memorial, and Hamilton Battery Memorial also enjoy protection through Allegheny Commons' designation as a City Historic Site. With a system already in place to safeguard public-facing art, it makes sense to expand upon it and protect pieces of art that are privately owned but publicly visible and have historical significance. The example that comes immediately to mind is the (former) Kaufmann's clock (featured above). Originally designed to rest atop a pole, it was later incorporated into the facade of Kaufmanns' in 1913 and remains one of the most recognized pieces of private art on public display in the City. The Clock has always been privately owned (from Kaufmann to Macy's to, now, Core Development) but was always intended for public display and to shape the street corner below. It is an iconic piece of history that helps define what makes Pittsburgh, "Pittsburgh". 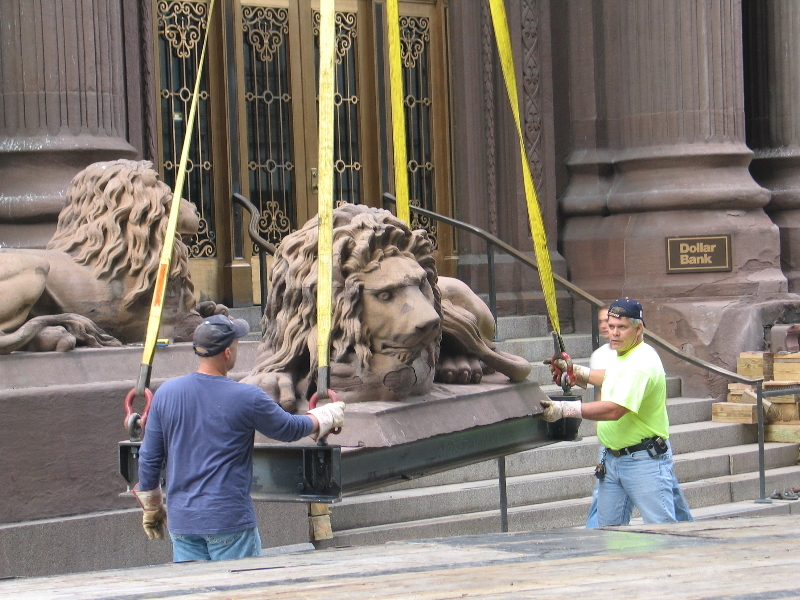 Similarly, Max Kohler's Lions (1871) that adorn the Dollar Savings Bank at Fourth & Smithfield have played such an important role in identifying that space they were recently replaced with near-identical replicas. Both have remained part of our city scape through the good hospices of the owners but a historic designation would ensure they will remain so for generations to come. Later this summer Preservation Pittsburgh hopes to add to the list of historically-designated pieces of art in the City by nominating the Catahecassa Monument in Schenley Park as part of our initiative to recognize the systems of springs around Pittsburgh. We hope that Mayor Peduto will give serious consideration to help expand the number of historically-designated art objects in the City through his safeguarding efforts over the next few months.